← Yi. Things will never be the same again (and again)! As we can see here… not everything tyrannosaur has to be Tyrannosaurus! This classic scene has been depicted many times…And it should have been an awesome one to watch. 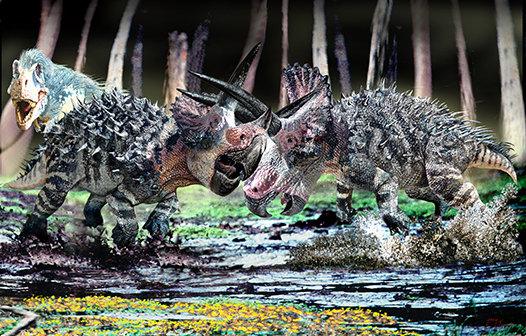 Triceratops was once depicted as a mud wrestler by Dr. Bob Bakker. Mike Kelly has been painstakingly putting together a treaty about Tyrannosaurus that wants to embrace everything: from local environments, to the prey, to the extant contemporary fauna and to the different approaches to recreate the image of the über predator… feathers and no feathers,,,. Obviously after my “conversion” through the discovery of Yutyrannus, there was no way I could go back to do Tyrannosaurus the way I had done all my life. Parsimony reigns in Palaeontology. We will need now hard evidence to see T. rex naked the way it used too be, even if for some the acceptance of image transition has been and continues to be very hard. And that has included me and Mike himself… But once you make your mind about the new image and understand why, the only question for the artist from then on is to make the image believable! I’m really looking forward to see Mike Kelly’s book finished and published. It’s going to be a real achievement at every possible level. Obviously the one showing the Keratin Revolution was not only T. rex… and Triceratops had to have his whole new make-up too! This time blending the hard evidence of hits skin, I have used a B&W stripped pattern that I have used before and curiously makes it blend quite well with the surroundings . Keep plugged in for more on the Keratin Revolution in the not so far future! This entry was posted in ceratopsians, tyrannosaurs, Uncategorized and tagged Bob Bakker, Keratin Revolution, Mike Kelly, Triceratops, Tyrannosaurus. Bookmark the permalink. 3 Responses to More previews from the Kelly Tyrannosaur Project. I depicted the feathered T.rex of the the northern range and the all-scaled T.rex subspecieces of the southern range.